Inspiration comes from so many unlooked for sources when one is on the right track and in need of it. Pondering how to shape, schedule and present the new upcoming interview series here, GOOD PEOPLE DOING GREAT THINGS, I stumbled on the following: found written on the wall in Mother Teresa‘s home for children in Calcutta. There are always scoffers and naysayers: do it anyway. This entry was posted in Hissy Fits and tagged Calcutta, compassion, faith, giving, Hotel Rwanda, India, Missionaries of Charity, Mother Teresa. Bookmark the permalink. love her! thank you, Margaret! Many years ago, she traveled through Japan. On a train she said she was thirsty. A man accompanying her poured water into a paper cup from the water fountain and brought it to her. She drank the water and saw some other passengers throwing such paper cups into the wastebasket by the fountain. She refused to hand over her cup to the man, and she quietly put it in her bag apparently for keeping it to make use of it again. Before I read about this in a newspaper, I had heard some criticisms against her, mostly saying she was only a Catholic agent trying to increase the followers to enrich the Catholic Church. I’m not a Christian or I don’t belong to any religious group, but her conduct (and other things she was doing) convinced me she was living a life linked directly with God. 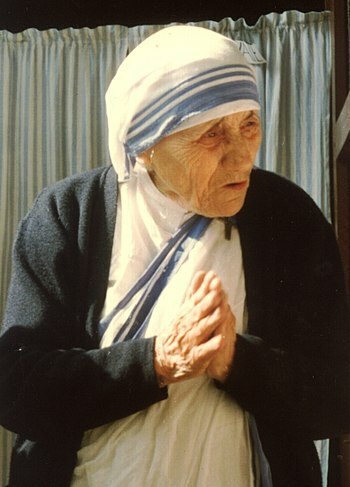 Critics, carpers, deriders flock like flies over someone (like Mother Teresa) people making waves and a difference. Although I was brought up and raised in the Catholic tradition, like Pope Francis (and Christ Himself) I have to throw up my hands and say “who am I to judge?” “Let he who is without sin cast the first stone.” This message at the core of the gospels is often glossed over or ignored in the effort to get the upper hand, in power plays etc. For me it’s all about mercy and connecting to the divine spark in all life. Making things better. Giving a hungry person a sandwich, a stray dog a bowl of water on a hot summer day. Creeds and sects are confining, misleading and never tell the whole story and often become barriers between mankind and God. Certainly not worth going to war about or repudiating anyone for. I simply intuit God on a very fundamental level and know God as love. That’s the sum total of my theology. Our lives are little dramas, I think, as we wrestle with this burden and the demands it places on our lives and hearts. I do like your blog ma’am, I hope I can learn from your knowledge.